a) The tundra is warming more rapidly than any other biome on Earth, and the potential ramifications are far-reaching due to global-scale vegetation-climate feedbacks Picture by: Pixabay. b) Map of all 56,048 tundra trait records and vegetation survey sites. Figure by Bjorkman et al., extracted from their publication in the journal Nature. Rapid climate warming in Arctic and alpine regions is driving changes in the structure and composition of tundra plant communities, with unknown consequences for ecosystem functioning. Up to 50% of the world’s belowground carbon stocks are contained in permafrost soils, and tundra regions are expected to contribute the majority of warming-induced soil carbon loss over the next century. Plant functional traits are directly related to vital ecosystem processes such as primary productivity and decomposition, so understanding trait-environment relationships is critical to predict high-latitude climate feedbacks, and yet such relationships have never been quantified at the biome scale. Quantifying the link between environment and plant functional traits is thus critical to understand the consequences of climate change, but such studies rarely extend into the tundra. As such, the full extent of the relationship between climate and plant traits in the planet’s coldest ecosystems has never been assessed, and the consequences of climate warming for tundra functional change are largely unknown. In a new study in the journal Nature authors explore the biome-wide relationship between temperature, soil moisture, and key plant functional traits (plant height, leaf area, leaf nitrogen content (leaf N), specific leaf area (SLA), and leaf dry matter content (LDMC), as well as community woodiness and evergreenness. 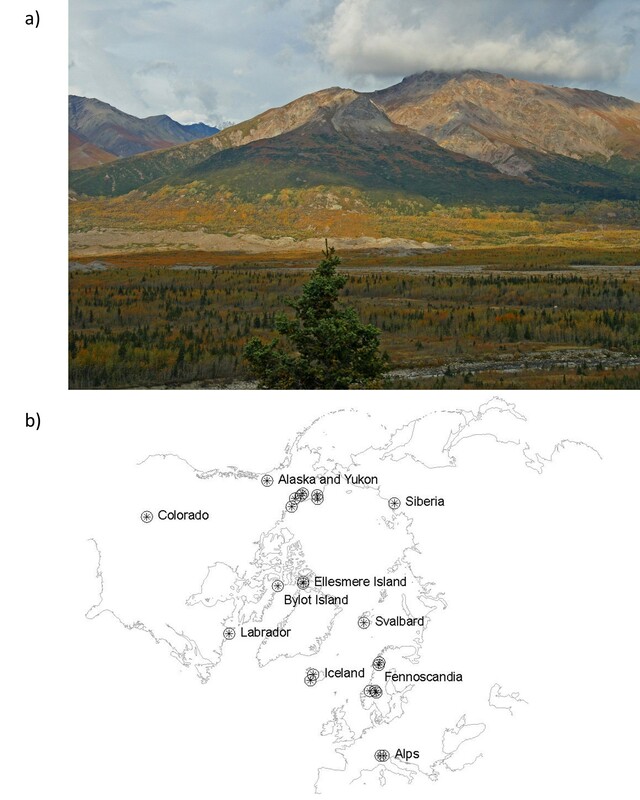 Authors integrated more than 56,000 trait observations with nearly three decades of plant community vegetation surveys at 117 Arctic and alpine tundra sites spanning the northern hemisphere. “We found strong spatial relationships between summer temperature and community height, SLA, and LDMC. Soil moisture had a marked influence on the strength (SLA and LDMC) and direction (leaf area and leaf N) of the temperature-trait relationship, highlighting the potentially important influence of changes in water availability on future plant trait change”, said Dr. Grau from CREAF-CSIC Barcelona. Over the past three decades, community plant height increased with warming across all sites, but other traits lagged far behind rates of change predicted from spatial temperature-trait relationships. The findings of this study highlight the challenge of using space-for-time substitution to predict the consequences of future warming on functional composition and suggest that tundra ecosystem functions tied closely to plant height (e.g., carbon uptake) will show the most rapid changes with near-term climate warming. “Our results reveal the strength with which environmental factors shape biotic communities at the coldest extremes of the planet and will enable improved projections of tundra functional change with climate warming”, said Prof. Josep Peñuelas from CREAF-CSIC Barcelona.